To even have the possibility of enjoying The Shack, you need to be equipped with two things. One, a belief or interest in Christianity; and, two, the patience to continue reading through a dark and emotionally exhausting experience in order to find a redeeming purpose. It is a book about a man who is broken by a terrible event in his life and must return to the scene of this devastating hurt. 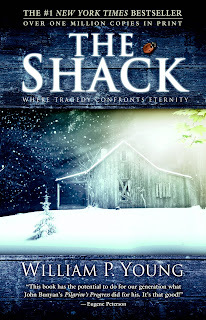 In The Shack, the man enters into a weekend-long conversation with God, Jesus, and the Holy Spirit. William P. Young, the author, is incredibly descriptive in his writing and draws you into some of the strongest imagery I've read in a long time. The story is poignant and beautiful, though folks who are not Christian may be turned off by the obvious religious base of the story. Although the novel may not be for everyone, the underlying theme is. Everyone has a "shack", a place of darkness and hurt that begins to overshadow the good in life. Everyone has a moment, day, month, or year, where doubt erases hope and fear overcomes faith. Some people experience it briefly and some for lengthy periods of time. Some events are widely recognized as tragedies while others may be something that only those affected see as significant. But no matter the circumstance and no matter the grief, The Shack reminds you that even hurt can cause us to grow back stronger and fuller and lovelier. A few weeks ago, I found myself with a few hours to kill in the Detroit Airport. As I wandered into the newsstand neighboring my gate, I came across this book. The next few hours seemed to fly by as I progressed through this story. The novel centers around a graduate student at Harvard, Connie Goodwin, in 1991. The year is important to note. I found myself wondering if this story would be remotely the same with the availability of instantaneous research that graduate students employ today (my own recent experiences included). Some of the best, and most puzzling, scenes of this novel occur as Connie thoughtfully considers all of the research options in her pursuit of a dissertation topic. Hours in the archives, digging through book racks and actually visiting places of public record set the tone for this story. As Connie struggles to find her topic and impress her advisor, her "free-spirited" mother (who ran a sort of commune for a good part of Connie's childhood) calls from her new home out west. Apparently, years before when Connie's grandmother died she left her home outside of Salem to her daughter - who had neglected to pay property taxes on it since. Her mother wants to sell the property, and Connie agrees to prepare it for sale. Once she arrives at the house her true adventures begin. As Connie's story evolves, so does that of Deliverance Dane and her descendants. The heaviness of home repair and research are lightened with a semi-predictable romance with a local man who has also done graduate study (at Brown), but now restores steeples. As she explores the story of Deliverance Dane, she learns more about herself and her family than she ever thought possible. Katherine Howe, who is herself a graduate student in Early American History, succeeds in writing an interesting and informative story which was very probably motivated from her own desire to find such an extraordinary original source. She is a descendant of two women who were victims of the Salem witch trials - one who survived them, and one who did not. This book is at once suspenseful, historically accurate (and informative), well written, and entertaining. Though at times it borders on predictability, it does not disappoint for anyone that enjoys historical fiction with some imagination. We love books so much that we decided to start a blog where we can share what we think of the books we are reading - the good, the bad and the ugly. These are solely the our opinions and you may disagree. That's great! Agree or disagree with us (we may agree or disagree with one another), leave a comment, start a discussion. We are high school sweethearts who have been together for eleven years and married for two. We are enjoying the Navy life in Norfolk, VA with our four year old beagle Mr. Bingley and our brand new daughter Evelyn Rae. Reading a good book allows you to live more fully, but sometimes it is difficult to find good books among the millions that are published. This blog is about helping each other locate literary gems and not waste money or time on the not so worthy. Feel free to add your thoughts as well.